In late October 1999, my grandpa, also named Scottie Westfall, was out squirrel hunting. While staking out one of his favorite stands of hickory, he heard brush cracking and a rabbit screaming. Suddenly, a cottontail rabbit came running down a game trail. The rabbit stopped at little copse of brush, just a couple of yards from where my grandpa was staking out the squirrel trees. Usually when one sees a rabbit running down a trail, something is pursuing it. In this forest, the rabbits get pushed hard by the red and gray foxes, and the coyotes do take more than a few. So my grandpa waited with his eyes trained on the trail from whence the rabbit came. Just a few minutes later, something small and white came jumping along. It followed the rabbit’s trail perfectly and then went into the brush where the rabbit was. The rabbit bolted before the creature could come near, and after white beast sniffed out the little copse of brush, it began to sniff around to see if it could pick up the rabbit’s trail again. It soon did and started hunting again, and as it came along it happened to raise its head above a log. Which created the perfect shot opportunity. My grandpa shot the animal and realized it was some kind of weasel. However, it was quite a bit larger than the common least weasel that he knew so well, and what’s more, the weasel was almost entirely white. My grandpa thought he knew all the animals of these woods pretty well. Weasels were the bane of the chicken coops when he was a boy, and he told me about trapping a few of them for their fur. He also told me of how he illegally ferreted with an albino ferret, using him in groundhog dens and abandoned pipe to drive out cottontail rabbits that sought refuge from extreme cold or barking dogs. But he’d never seen a white weasel before. I vaguely knew that there were white weasels in the United States. I had read all about ermines and something called “Bonaparte’s weasel” that turned white in winter. But teenage me just decided it was an ermine, and we left it at that. He did a informal survey of all his hunting buddies, and none of them had ever heard of an ermine or a white weasel. It’s been in the freezer ever since. I knew there was something odd about it. I’ve written about it on the blog before. I’ve come to the conclusion that it was a long-tailed weasel. I don’t want to make this confusing, but in the Eastern US, there are two weasels that turn white in the winter. The ermine or short-tailed weasel is the one that Old World readers might know as a stoat. Most stoats from the British Isles don’t turn white in winter. This species is found throughout Eurasia and North America, but it has never been recorded in West Virginia. It comes only as far south as Pennsylvania. An old name for this weasel is Bonaparte’s weasel. The long-tailed weasel is found in North and South America. It does turn white in winter, but not all of them do. The Maryland/Pennsylvania border seems to be the geographical separation between weasels that turn white in winter and those that don’t. And in Pennsylvania and Ohio, not all weasels turn white. Last week, I was contacted by a researcher from North Carolina State University, who is working on a study of snowshoe hares in the High Alleghenies. One of their research questions involved West Virginia’s long-tailed weasel population and their perennial brown pelage. If you look up white weasels in West Virginia on Google, you wind up at my blog. So I met with this researcher in Elkins, and it turns out that this weasel is a real weird one. If you look at the logic of the two potential winter white weasel species I suggested, there are two main possibilities about what this animal could be. It’s either an errant long-tailed weasel that doesn’t realize that just happens to have the genetics to turn white or it’s the first documented ermine in West Virginia. I think the former is more likely. But that’s not where it gets really bizarre. This weasel was not killed in the Allegheny Highlands, where the snow cover lasts the longest every year. It is certainly true that some of the higher elevation places in West Virginia are more like Maine or Eastern Canada, and one would think those places would be full of weasels that turn white in winter. 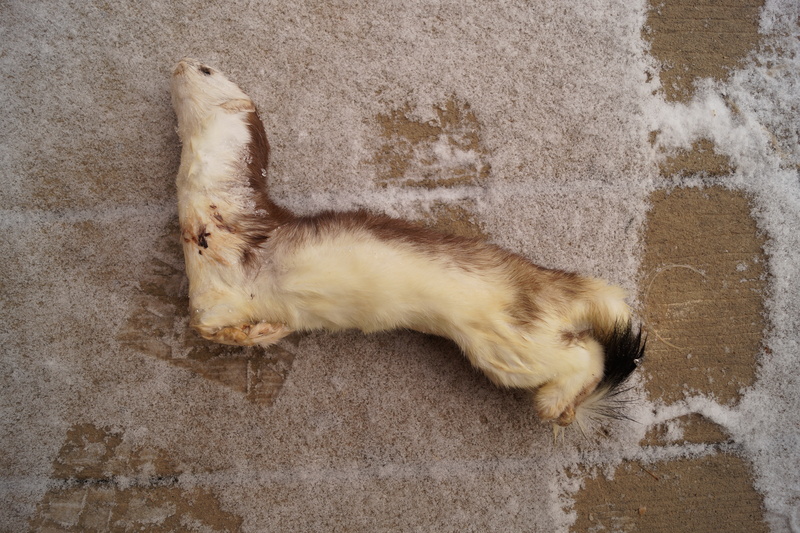 This weasel was killed in the Allegheny Plateau, and in the late 90’s, the winters were so mild that there was virtually no snow cover at all in this part of the state. So why would a weasel turn white? These woods where this weasel roamed are full of barred owls and red-tailed hawks that would love nothing more than have weasel to eat. A white weasel on the forest floor would just be advertising itself to the winged predators. So this weasel raises many questions. Soon, I’ll be setting out weasel gland lure with my trail camera to see if there are other weasels like this one in the area. Maybe there is an anomalous population of weasels in this part of West Virginia. Or maybe this one was just a fluke. Whatever it was, this weasel is a mystery. Some may give my late grandfather hell for shooting this weasel, but if he hadn’t shot it, we wouldn’t have this specimen, which might be the first record of a weasel molting to white in a population south of Pennsylvania. Charles Darwin got into natural history as a recreational shooter. He traveled around the world on the Beagle killing unusual animals left and right. He killed the South American fox species that bears his name with geological hammer. If Hornaday had not killed the “big old ‘gator of Arch Creek,” we wouldn’t have known that crocodiles lived in Florida. My grandfather was pretty well-versed in natural history, and I think that if he were alive today, he would be impressed that this animal he killed while squirrel hunting would raise so many questions– and be such an anomaly.